Prior to 1999, dramatic fluctuations in homicide rates were driven by changes in the rates of firearm homicide among men aged 15–24. Since 2000, the overall homicide rate has appeared stable, masking any changes in population subgroups. We analyzed recent trends in homicide rates by weapon, age, race, gender, state, and urbanization to determine whether the risk of victimization increased substantially during 1999–2005 for demographic subgroups. The analysis of WISQARS™ data and Wonder data from Centers for Disease Control and Prevention revealed no trend in the homicide rate nationally between 1999 and 2005; this obscured large increases in firearm homicide rates among black men aged 25–44 and among white men aged 25–34. Between 1999 and 2005, for ages 25–44 combined, the increase for black men was 31% compared with 12% for white men. Significant increases among men aged 25–44 occurred in Alabama, California, Michigan, Minnesota, Nebraska, Nevada, New Jersey, Ohio, Pennsylvania, Texas, and Washington. The firearm homicide rate increased the most in large central metropolitan areas (+32%) and large fringe metropolitan areas (+30%) for men aged 25–44. 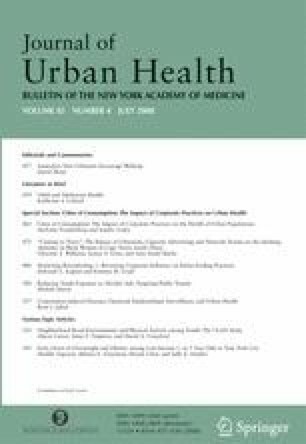 We conclude that the recent, unrecognized increases in firearm homicide among men aged 25–44, especially black men, in large metropolitan areas merit the attention of policymakers. This research was supported by the National Center for Injury Research and Prevention, Centers for Disease Control and Prevention (Grant CCR302486), through a grant to the Johns Hopkins Center for Injury Research and Policy. Heron MP, Smith BL. Deaths: leading causes for 2003. National vital statistics reports; vol 55 no 10. Hyattsville, MD: National Center for Health Statistics. 2007. http://www.cdc.gov/nchs/data/nvsr/nvsr55/nvsr55_10.pdf. Accessed on: March 1, 2008. Fox JA, Zawitz MW. Homicide Trends in the United States: age trends. Washington, DC: Bureau of Justice Statistics, US Department of Justice; July 2007. http://www.ojp.usdoj.gov/bjs/homicide/teens.htm. Accessed on: March 1, 2008. Centers for Disease Control and Prevention, National Center for Injury Prevention and Control. Web-based Injury Statistics Query and Reporting System (WISQARS) [online]; 2008. www.cdc.gov/ncipc/wisqars. Accessed on: March 1, 2008. Centers for Disease Control and Prevention. CDC WONDER: compressed mortality, 1979–1998 Request. http://wonder.cdc.gov/cmf-icd9.html. Accessed on: March 1, 2008. Deborah D, Ingram SF. 2006 NCHS Urban–Rural Classification Scheme for Counties. http://www.cdc.gov/nchs/r&d/rdc_urbanrural.htm. Accessed on: March 1, 2008. Research and Analysis Unit, Indiana Dept. of Workforce Development. Historical Labor Force/Unemployment Data for United States. http://www.nidataplus.com/lfeus1.htm#annl. Accessed on: March 1, 2008.